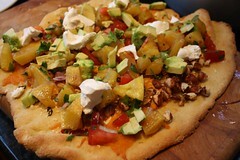 The second dish we chose from Vegan Table is the South of the Border Pizza. 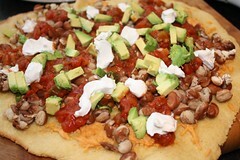 The dough is made with cornmeal in and the toppings include pinto beans, salsa, jalapenos and sour cream. Not your typical pizza but full of flavours we enjoy so we were excited to try it. My main issue was which salsa to use. I can only buy decent salsa online and I didn’t get organised enough to order any. So I wondered whether to make it and use a fresh salsa, or buy a bog standard supermarket brand. I decided to do both and make two pizzas. Then I had to decide which recipe to follow for the salsa. I absolutely love the grilled pineapple salsa from Vegan Brunch, so, knowing that there are people out there who choose to eat pineapple on pizza, I went with that one. I’m generally a disaster area around anything to do with yeast and this was no exception. It’s like it knows I’m scared and plays up on purpose. So the dough was a little tougher than it should have been but I did like the cornmeal in it. Predictably we preferred the tomato salsa version but the pineapple one was OK. I hardly ever like mixing fruit in a savoury meal but this salsa is so good I’ll make an exception. So the basic choice of wine style was sound: the chilli heat, salsa sharpness and the creaminess of the vegan cheese, as well as the yeastiness of the pizza base wanted a clean full flavoured wine. Sadly, this wasn’t it. Oversold would be putting it mildly. The blend was a rather flabby and surprisingly insipid one, which didn’t stand a chance against the simple clearly defined tastes of the dish. Decanter magazine gave the wine a bronze medal: was that in a field of three? Given the choice of great value Chilean options around, this is not a choice we’d suggest anyone repeats. Any of Vintage Roots’ range of Adobe, Touchstone or Novas reds, all vegan and well under a tenner, would serve you better, or if you’re feeling flush, try the Emiliana Coyam – about fourteen quid and a properly structured blend. Don’t forget to see how Tami and Jim got on too! We’re moving to Voluptuous Vegan for our next book choice. I’ve already made quite a lot from that book and I’ve loved it all, so I’m excited! 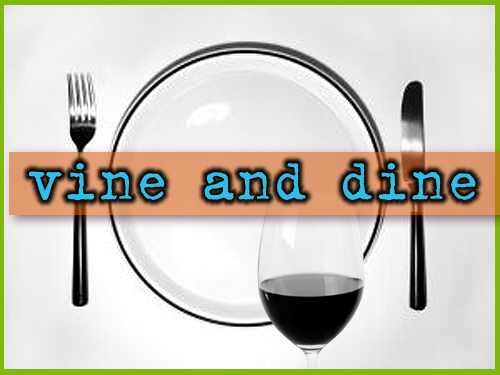 We moved to Vegan Table for our next Vine and Dine. I’ve had it for ages and read through it many times but only made one thing. I like the way it’s laid out but somehow I have other similar recipes or nothing’s happened to catch my eye. I like how these challenges force us to try new things. 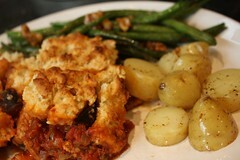 We both liked the look of the tempeh and aubergine pot pie straightaway so decided to go for that one first, then picked the green beans to serve alongside it. I also cooked some baby new potatoes too so Matthew wouldn’t go into a low carb shock (pastry notwithstanding). As I was making the pie I felt it just needed something else so I added some dried basil. I felt like it would enhance the mediterranean flavours but I followed everything else exactly. With the beans I used a bit less maple syrup because as you’ll know we aren’t over mad on sweet flavours here. This was a really tasty dish. The beans were fabulous and I adored the walnuts in them. The topping for the pie is an absolute winner – much easier than pastry and a nice comforting crust which I’ll make again for sure. The filling was good but definitely benefited from the extra basil. I’d probably marinate the tempeh another time for an extra depth of flavour. picture of the beautiful Carcassonne, in the world’s biggest vineyard, the Languedoc, and to plug Kate Mosse’s Labyrinth, a novel which takes you there, and you know you want to know more about the Albigensian crusade against those heretic Cathars. The wine is a blend of Syrah with the Egiodola grape. Vintage Roots say they know little about Egiodola except it tastes great, which it does: forest fruits with some light tannins and the ubiquitous Languedoc herbiness, in this bottle bay leaves, rosemary and thyme. Some cursory googling uncovers the fact that it is a blend of the slightly more common Fer Servadou and Arbouriu grapes, means ‘pure blood’ in Basque, and apparently grows well in Brazil. The food match was spot on for our tastes. The pastry in the biscuit dough, for me, cries out for that metallic tannic element, and that same element matches aubergine and capers, while the overall smoothness washed down the tempeh so easily and delightfully that we had to finish the meal up with the second half of another Domaine de Brau wine, their ‘Pure’ Cabernet Sauvignon, made just down the road from the other bottle. I think if you aren’t drinking a wine from the South of France, then you should choose the south west ofFrance instead and crack open one of those clarets you’ve had for ages because it’s so hard to find vegan food which you think is big enough and flavourful enough for it. And enjoy the quaffing.